Salads are an amazing way to vary meals and keep prep time to a minimum. We know it can be hard to keep salads interesting, we highly recommend this colorful salad. It makes a hearty lunch or dinner thanks to 24 grams of protein and 8 grams of fiber. The satisfying crunch cucumber and red onion is balanced with fresh tomatoes, fragrant chopped parsley and bright lemon to top. 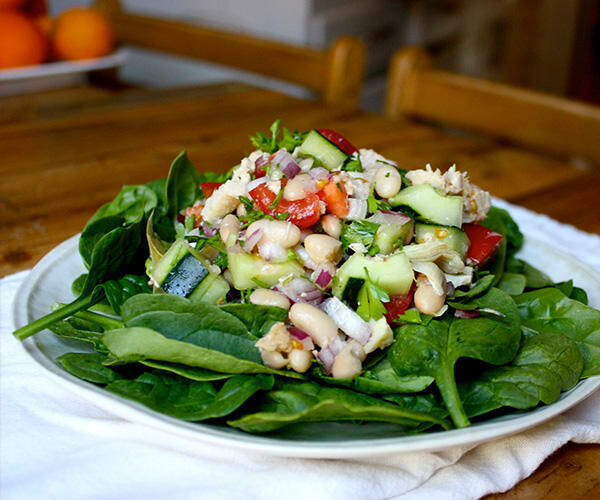 Tip: Keep the bean and tomato mixture separate from the spinach until you’re ready to serve. This hearty salad features crunchy cucumber, red onion, fresh tomatoes, fragrant chopped parsley and bright lemon to top. 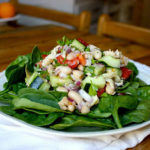 Combine tuna, beans, onion, cucumber, tomatoes, artichoke hearts, and parsley in a medium bowl; mix well. Evenly divide spinach between four serving plates. Top evenly with tuna mixture. A great lunch option. Replace white beans with more veggies for dinner. Photos and recipe by Kirsten Morningstar.